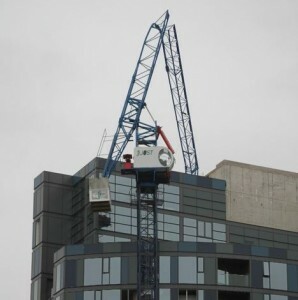 Following the recent collapse of three luffing jib tower cranes during high winds the UK’s Health & Safety Executive (HSE) has issued a safety alert relating to tower cranes. The alert is intended for tower crane operators and serves as a reminder that any luffing jib cranes left unattended in the out of service condition must be in free slew with the jib at a safe out-of-service radius. It also states that operators must ensure they have the most accurate, up to date information from the supplier or manufacturer, as some manufacturers have recently changed their guidance. – Checking that information provided by the manufacturer/supplier includes the correct minimum out of service radius. – Checking both after erection and periodically in service, the function of the device that releases the slew brake and places the crane in free slew. – Checking both after erection and periodically in service, that the condition of the slew drive motors, gearboxes and slew ring bearing has not deteriorated to the extent that the crane is prevented from slewing freely. – Checking both after erection and periodically in service, the setting and function of any devices that warn the operator that the crane jib has not been left parked at the correct out of service radius and/or the slew brake has not been released. – Ensuring that operators have been provided with instructions on how the crane should be placed in free slew and the correct radius at which the jib should be positioned when leaving the crane unattended. This should include measures to routinely check that the operators understand and are following the instructions provided.